IT'S TOFFEE'S TURN: BANKRUPT MALAYSIANS - IF NAJIB IS YOUR NEXT PRIME MINISTER. BANKRUPT MALAYSIANS - IF NAJIB IS YOUR NEXT PRIME MINISTER. Well most Malaysians can say "give up" and be resigned to a life of Bankruptcy if the Barisan gains control of Parliament in the next elections. Yes this is a fact, and all those who believe Najib's rhetoric had better think again, his constant promises, his constant lies and his inability to control the nations finances should be the lesson to learn from. His refusal to come out and clear his name for, the sacking of the Attorney General, the unresolved murder of Altantuya Sharibu, the 1MDB case and much more, has made it untenable for him to carry on as PM. The office of the Prime Minster Of Malaysia has thus been compromised. Moreover and to make matters worse he does not even have the popular vote of the Malaysians meaning that in the last elections more voters did not want him and BN than want him and BN the majority of voters in Malaysia wanted the Opposition to rule. Najib's government and very particularity him, are one of the very few if not the only government and O1, to have been accused of Kleptocracy. Very honestly I am yet to hear of another therefore in my books he is the only one. Malay, Chinese and Indian contributing factors. For those of you who have managed Malays, they will tell you that Malays are famous for taking loans., and Malays make up sixty percent of the population, the Indians follow suit through dire need they struggle to make ends meet. Icna't tell you much about the Oran Asal in Sabah and Sarawak, I am quite sure they are not the borrowing kind like their West Malaysian brothers. From my own personal experience these groups the will come in droves looking for a Company loan and threaten to leave if the Company does not give them a loan. To "help employers" (not really, employers saw it as a great escape route though) with the problem in those days, (I do not know if it still exists), Bank Rakyat would offer Malays a loan at about 1 or 1.5 percent interest less than what they'd give a non- Malay. That really made life easy for employers, they did not have to offer any security for the loan nor worry about any security for loans the employee took, all they had to do was to agree to do his monthly deductions as long as he was in the employ of the Company. The employee taking the loan had to have a guarantor and it would normally work this way with them; "I guarantee you and you guarantee me" and the loan problem for the employee was solved. As long as there was a loan to take they took it and after repaying the loan they'd begin all over again. In some Companies and this is not in the minority the loan shark does a roving business and he holds the bank card of the employee, taking his loan repayment installment first before drawing money for the card holder. Then of course there are credit cards, and the Banks are all around the place offering credit cards and these people are all around the place signing up for credit cards even today. You can take a loan with your credit card and that is precisely what they do till they over spend.Credit card debt in this country is one of the highest per capita in Asia. Some young Chinese boys use this to take money for gambling and then they get into all sorts of troubles. They'd take another credit card and take a loan on that card to finance part gambling and part repayment for the other overdue credit card. I have personally come across many of these cases.When all fails some resort to theft and other petty crimes and I feel if left unchecked the crimes could get bigger. Credit cards, installment schemes for purchase of cars, household equipment suppliers like the radio TV shop, Camera shops etc hs made super easy for many and many take loans, and many do not repay. I know law firms that just send out notices to these people on behalf of banks. What is even worse, is that there are motorcar credit Companies offering loans without down payment and if that was not bad enough they'd advertise blatantly saying " Customers in the Blacklist" also welcome." If anyone comes out saying, "Kepala Otak Kau" I have the perfect reply for him. 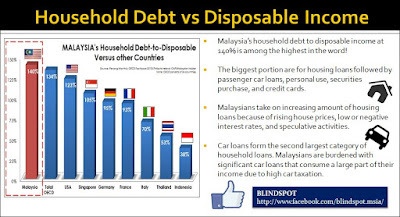 There are housing loans, Educational loans, vehicle purchase loans and what not and today the household debt in the country is at above 70 percent and that is a very dangerous figure, the World Bank does not trust Malaysian government's figures and that is a serious problem, it means the nation has lost its credibility. Forecasters say the property market bubble is about to burst, housing schemes are struggling to get buyers, whilst people who bought on speculation are now finding it a problem selling and even renting their property. With the expected increase in unemployment many buyers are expected to default on their housing loans, so what recourse have the banks? If the bubble does burst housing developers will have to get real, developers must lower the price of houses and other property, they are just simply overpriced and developers are getting greedier by the day. Of course they can argue that it is all driven by supply and demand, they will not talk about the speculators. Well the time is here the speculatoris aboutto get roasted, and the developer is in for hard times. When the bubble bursts property prices will decline steeply, at rates never witnessed before and the Government must not and should not go in to bail them out, that will be our biggest mistake. Reluctantly present house buyers will default on their loans as the amounts they are currently paying will be much higher than what developers will be offering for bigger and newer property and this will send the industry into a frenzy. The burden must not be left to the bona fide buyer alone, the Banks that fed this greedy enterprise have to bear the risk as well and so too the developers, there will be huge lessons to be learned once this happens and make no mistake it is already happening. From what is being said now about the state of the property market the bursting of this bubble can be expected sooner rather than later, this will force banks to foreclose on property and declare many a Malaysian Bankrupt. Not just one or two but many and you could be one, Yes a Bankrupt., and the only persons who have the ability to stop that are found in Pakatan Harapan no Joke. Najib has to take the blame for this, the drastic depreciation of the Malaysin Ringgit was caused in no small way by Najib's mismanagement of the Malaysian economy but rather in a big way, by the huge 1MDB scandal and now to add to that there are two more maybe even bigger scandals to follow, one the FELDA scandal and the other the Tabung Haji scandal, what surprise in the scandal storehouse is awaiting to be revealed next is anybody's guess. Najib is now trying to mine the EPF for funds, the body has been been able to manage its finances very well all this time, but with Najib it is a different story. He has placed his appointees in key positions in the EPF and is beginning to treat it as his own Bank. If Najib comes back to power or for that matter anyone in the BN, this beloved country is doomed to the fate of becoming a Bankrupt Nation and we shall become a Nation of Bankrupts through no fault of ours. Want to know what it is like? Well we are lucky, we can ask the Greeks, the Spanish, the Portuguese, the Irish and the Argentinians they'll tell us. One of he most frightening things they'll tell us is that our money in the bank will only be part our money, and we can take only part of that out. Now does that make you feel right? Certainly not.